A new book summarizing much of what we know about oceans and the role they play in shaping our Earth's climate was just published. For researchers like myself, we often become fixated with learning the newest facts or reading the latest studies in our fields. Every so often, however, it is necessary to take a step back and provide a retrospective look at how our knowledge has developed with time. Such a retrospective was just provided by some of the world's most qualified oceanographers. It is an update to a legendary text that was first printed in 2001. 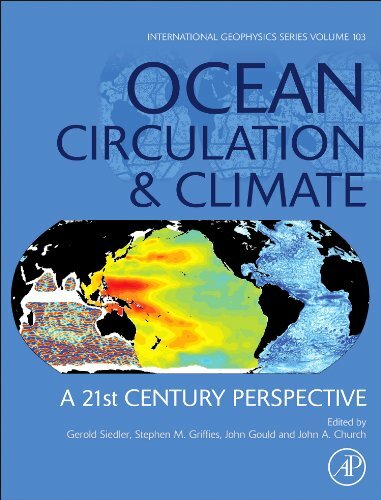 This is the second edition of "Ocean Circulation and Climate – Observing and Modelling the Global Ocean" published in 2001 at the end of the World Ocean Circulation Experiment (WOCE). 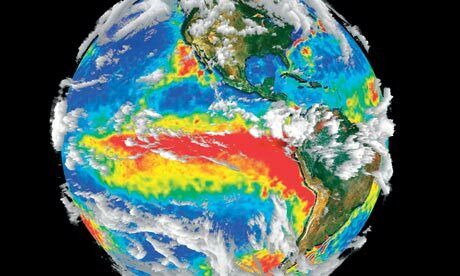 During the 1990s WOCE built on the availability of a new generation of altimeter satellites and carried out the first global scale study of the role of the oceans and their circulation in earth's climate. WOCE's primary objective was "to develop models useful for predicting climate change and to collect the data necessary to test them". Since WOCE there has been enormous further progress both on ocean observations and modeling. The Argo array of profiling floats (a technological development started during WOCE) now routinely monitors the temperature and salinity of the upper ocean. The series of altimeter satellites continues. These strands now allow a better understanding of the inherent variability of the ocean not available in 2001. In parallel, the relentless increase in computational power permits better representation of crucial ocean processes. The new book has been produced simultaneously with the preparation of the 2013 IPCC WG1 5th assessment report and provides useful and up-to-date background on ocean-related issues central to the IPCC's assessment. The remarkable progress in this area of ocean science since the turn of the century means that many of our present-day modeling and observational capabilities could only have been dreamed about in the 1990s. Thus the book, subtitled "A 21st Century Perspective", is both timely and important. The 78 authors provide a truly international perspective as recognized experts in their respective fields. Eight were also authors of the IPCC WG1 AR5, which was released this fall, including Thomas Stocker (Chairman of WG1) who wrote the first chapter, "The Oceans as a Component of the Climate System". Three of the editors, Gerold Siedler (Germany), John Gould (UK) and John Church (Australia), were editors of the first edition and were joined by Stephen Griffies (USA) to provide additional expertise on modeling. All are internationally recognized experts in their respective fields. "Were it not for the ocean's ability to absorb substantial amounts of heat and carbon, the effects of worldwide anthropogenic climate change would be much larger. The ocean is therefore already an important mitigating element in the Earth System"
As a part-time ocean scientist myself, and a self-described ocean nerd, this may be the first item on my Christmas list. There are fewer and fewer places nowadays where one can escape the sound of humans. These sanctuaries of precious quiet do not include much of the ocean, which is constantly thrumming with civilization's noise pollution. 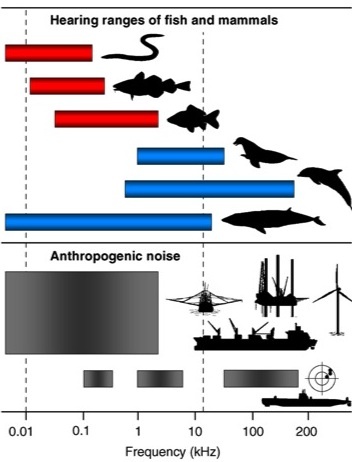 The bulk of human-generated audio in the seas comes from large shipping vessels, according to a NOAA working group on marine noise. For a while now the U.S. government and other concerned groups have investigated the possibly harmful impact underwater noise might have on marine life – especially cetaceans like whales and dolphins that use sound to communicate. Thanks to one of the parties involved in that effort, we now can visualize how our massive seafaring machines are creating raucous house parties in the northern Pacific and Atlantic, in a cluster around Europe, in busy Middle Eastern shipping routes and many other regions of intense clamor. These two maps of merchant-shipping commotion were shared by Michael Porter, a participant in the NOAA group who is also president of Heat, Light, and Sound Research in La Jolla, California. They represent differing levels of noise in the oceans during 2006 at a depth of about 650 feet, which sound like low-frequency hummmmms that travel hundreds of kilometers. Porter and his team assembled these models as a way to distinguish shipping noise from other background sources, such as sonar and pile driving. What are the effects of boat noise on the ocean ecosystem? Is it mainly potential harm or harassment to animals? There is a worry about such noise as a 'pollutant'; however, one should be very careful about jumping to that implied conclusion (that it is causing harm). We prepared these maps originally in the context of a NOAA effort to provide the background levels against which other sources (e.g., pile-driving noise) might be compared. We view it as a sort of background hum that you might compare to highway noise. You will find scientists that think it's obvious that this sound harms the animals and scientists that think it's very unlikely. Scientists, of course, are human also and not immune to hasty, emotional conclusions. In truth we simply do not know if they are bothered by this noise field. However, these soundscapes can help inform the research process. The main interest here is on how it might bother animals or how other sound sources that might be even more bothersome compare to this pervasive background field. Where are the noisiest places that you found? Are they typically near major port cities, or elsewhere? At this stage, I don't have too much to say about the noisiest places. 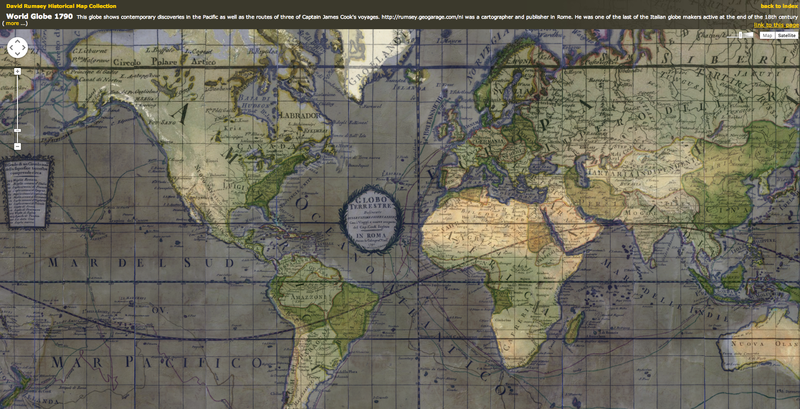 The map itself answers the question fairly completely if we're talking just about ship noise: the loud places are generally near the shipping lanes. However, we see high levels, for instance, in the Gulf of Mexico where there is a lot of seismic exploration (not shown on the shipping-noise map). We also see high levels in areas where there is pile driving or, separately, Navy sonar exercises. That statement should be footnoted with the observation that the measure of 'high levels' depends on the metric. Shipping is always on; pile driving and sonar are not. Is there any effort being made to cut down the levels of ocean noise around the world? If so, who's making it, and how? There is a lot of popular concern about the effects of sound on the marine environment. In particular, there was a major public outcry following the stranding of 16 whales during the Bahamas incident. The U.S. Navy did an extensive study and concluded that their sonar was a likely cause. There have been other incidents. Similarly, there was a great deal of public concern following significant fish kills associated with pile driving for a bridge near San Francisco. To provide context, one should also consider the roughly 1 million animals that are 'bycatch' in the fishing industry. We don't have a strong position about whether this is a serious issue; we merely seek to provide information for bioacousticians and conservationist to assess the issue. Do you know of any ports or governments that have sound-dampening programs? The European Union has developed a Marine Strategy Framework Directive and considerations about ocean noise are part of that directive. As a result various countries in the EU are taking steps to assess or mitigate marine noise. I'm not intimately familiar with the U.S. process but NOAA and BOEM are closely involved in permitting of Navy exercises and seismic activities and noise studies are a major concern. The U.S. Navy, for instance, does enormous studies to forecast 'takes' of marine mammals associated with Navy exercises. However, the word 'take' here suggests something extreme but actually includes almost any observable effect. What's the difference in meaning between the 100 Hz and 200 Hz maps? It is often a challenge to express this sort of info for a non-technical audience. I would say that 100 Hz is a tone that would correspond to a key on the left half of a piano and 200 Hz is exactly one octave higher but still to the left of middle C (about 260 Hz) or A440 (440 Hz). The sound level is presented in "third-octave bands" so the plot for 100 Hz is really showing the sound level that would be heard by a listener who could only hear a third of an octave around that 100 Hz tone but was deaf to notes outside of that. This could sound like an odd way of presenting things but it allows a scientist to understand the noise in relation to a wide-variety of species of animals that may be able to hear in different bands. It has long been obvious that by far the most delusional element in the Government’s shambles of an energy policy is how it subordinates all else to an obsession with building thousands of hopelessly inefficient and absurdly oversubsidised windmills. This is now only made worse by George Osborne’s bid to appease his backbenchers by transferring a fraction of the 100 per cent subsidy paid to those increasingly unpopular onshore wind farms to the giant offshore wind farms, which already receive a 200 per cent subsidy, making such electricity as they produce six times more expensive than that we get from coal. It is now a year, however, since a report for the Renewable Energy Foundation by Prof Gordon Hughes, a former senior energy adviser to the World Bank, dropped what should have been a further huge bombshell into the energy debate. Using official data from the UK and Denmark, Prof Hughes showed that we have now been building turbines long enough to see that, due to wear and tear on their mechanisms and blades, the amount of electricity they generate very dramatically falls over the years; so that a turbine that initially produces on average at 25 per cent of its “capacity” can degrade over 15 years to produce less than 5 per cent. With offshore turbines, the effects of weather and salt corrosion are so damaging that output falls from 45 per cent to barely 12 per cent. I gather that Prof Hughes showed his research to David MacKay, the chief scientific adviser to the Department of Energy and Climate Change, who could not dispute his findings. So DECC is fully aware of this devastating flaw in its projections, but presses on with its insane policy regardless. BBC : UK energy mix: Where does our power come from? Sylvia Earle is an oceanographer, aquanaut, and author. She was the chief scientist at the U.S. National Oceanic and Atmospheric Administration from 1990 to 1992. Time magazine named her the first "Hero for the Planet." Mankind is consuming the ocean’s resources at an alarming rate. How do we sustain this vital resource for generations to come? National Geographic Explorer-in-Residence Sylvia Earle outlines some of the ways to save this vital ecosystem. Predicting the future state of the ocean is tricky, partly because we still know so little about this vast ecosystem that makes up so much of our planet. Presently, less than 10% of the ocean floor has been mapped with accuracy comparable to what exists for the terrestrial parts of our planet, or Mars, Venus and the dark side of the Moon. Little is known about most of the ocean itself, the water that exists between the upper sunlit region and the deep terrain below. While a dozen people have walked on the moon 240,000 miles (390,000km) above the Earth’s surface, only three have descended – and returned – from the deepest part in the sea, seven miles (11km) below our realm. A recent 10-year assessment of life in the sea accounted for about a quarter-of-a-million marine species, with an estimated million, perhaps 10 million more yet to be discovered and at least given a name (and that doesn’t include microbial forms). The largest animal in the sea, Architeuthys dux – the giant squid of all giant squids – eluded being seen alive by humans in its own, dark realm until 2013. What else is out there, down there, awaiting discovery? While the magnitude of our ignorance is vast, enough is known to realise that the ocean governs the way the world functions, drives climate and weather, generates more than half of the oxygen in the atmosphere, shapes planetary chemistry, stabilises temperature, and otherwise makes Earth hospitable for humankind and life as we know it. Water is the key, the single non-negotiable thing life requires. Earth’s oceans are 97% water, but in reality it is much more – a living minestrone, dominated by a microbial matrix of bacteria, single-celled organisms, viruses and microscopic planktonic organisms as well as legions of small, medium and large creatures that together shape planetary chemistry. The ocean, including the watery realm deep within the cracks in the rocks under the seafloor, comprises more than 90% of the biosphere. We now know the ocean is the cornerstone of Earth’s life support system. It is the living blue engine that sets Earth apart from any other place in the Universe that we know of. If it is in trouble, so are we. It is, and we are. Once thought to be too big to fail, it is increasingly obvious that there are limits to what can be put into the sea, such as CO2, toxic and nuclear waste, plastic debris. And there also limits to what can be taken out – oil, gas, minerals, wildlife – without serious consequences to things we care about: the economy, our health, security and, most importantly of all, our existence. We should hold as our highest priority taking care of the ocean systems that make our lives possible. So, 40 years hence, what will the oceans be like? Some of us rely on ocean wildlife as a source of locally caught and locally consumed food, but industrial-scale extraction of shrimp, fish and other animals for luxury markets, fertiliser, oil and food for domestic animals is swiftly depleting wild populations both in coastal areas and increasingly in the high seas, beyond local jurisdiction. Fish and other ocean wildlife are taking on new importance in the eyes of many as vital elements in ocean ecosystems, just as wild birds, once primarily targeted for the table, are now regarded with significant ecological and aesthetic esteem. Already, tourism that relies on living fish and intact ocean ecosystems is economically more valuable than fisheries in many island countries. A live whale or whale shark or coral reef fish can be a source of tourism revenues for decades or taken to market – once. Perhaps by 2050, fish watching will rival the sport of spotting birds. By then, however, some species may be rare or non-existent. Ninety percent of many kinds of commercially exploited species – tuna, swordfish, sharks, marlin, salmon, cod, grouper, seahorses and other ocean wildlife – have been extracted already, plucked from the sea much faster than they can recover. Sharks, once feared as voracious man-eaters must now fear man (and woman) as voracious shark-eaters. In the next 40 years, either fishing policies will have shifted toward reduction of large scale exploitation of ocean wildlife by choice, or they will have shifted because the number of fish can no longer justify the investment needed to catch them. It is likely that some creatures, such as Northern Right Whale, now numbering about 300, will not survive, nor will several other marine mammals with fewer than 1,000 individuals – the Mexican Vaquita, New Zealand’s Hector’s and Maui dolphin, the Mediterranean Monk seal. The outlook for bluefin tuna is bleak given the swift decline to fewer than 10% of its 1970s population, which coincided with a sharp increase in their value for luxury tastes. In 2012 a young bluefin sold in Tokyo for $736,000; in 2013 one weighing 222kg (488lb) brought $1.8m – kilo for kilo eight times the value of silver. Presently, aquaculture accounts for about half of all of the aquatic animals consumed, and the amount is increasing. Some methods, especially water-efficient inland closed systems (“more crop per drop”) which focus on fast-growing plant-eating fish, are an especially promising, cost-effective way of translating energy from the sun through plants to animal protein for human consumption. The same rationale that has led farmers to raise plant-eating animals on the land (chickens and cows rather than leopards and owls) is driving a trend toward cultivation of catfish, tilapia, carp and other herbivorous fish. Rather than squeeze valuable omega-3 rich oils from small fish and krill, some companies like Martek Biosciences are cultivating oil-rich plankton in land-based facilities, thereby setting a high standard for smart aquaculture. It is likely that by 2050 the present tendency to raise carnivorous fish such as salmon, tuna, sturgeon and Arctic char will be limited to high-end luxury markets owing to the mathematics of food cost and efficiency. It takes about two pounds of plants to grow a pound of year-old tilapia or chicken. The older the animal and the farther up the food chain, the higher the cost. Several thousands of pounds of plants are invested in a three-year-old cultivated salmon and even more in wild 10-year-old tunas or sharks that occupy the end of a long, convoluted food chain. In the last 40 years, half the coral reefs, mangrove forests, coastal marshes and seagrass meadows have disappeared. Hundreds of coastal dead zones have developed and the increased carbon dioxide in the atmosphere, now passing 400 parts per million for the first time in human history, is driving planetary warming, melting ice, sea level rise, and most worrisome of all, perhaps, acidification of the ocean. In recent decades coastal nations have claimed jurisdiction over waters 200 miles from the shore, greatly extending their responsibilities – and opportunities – into the ocean. With half of the Arctic’s summer sea ice now gone, how long before open water will prevail there the year around? From zero coastal “dead zones” in 1980 to hundreds today, how many will there be when today’s children are having children? Will human ingenuity and the will to resolve the problems facing the ocean – and therefore our future prosperity – be enough to avert the dire predictions about what will happen if we do not? Halfway across the Pacific Ocean on Midway Island, I recently contemplated these weighty questions in the presence of a Laysan albatross known as Wisdom, a bird banded with an ID tag in the 1950s and at the moment serenely warming her most recent egg. She was learning to fly over broad areas of the open ocean at about the same time I first began to dive under the sea. During her decades of flight and annual returns to her special nest site, she has witnessed a catastrophic decline of her species and other sea birds coincident with more than a doubling of the number of humans. She has survived the avalanche of trash, lost and discarded fishing gear and plastic debris new to the sea in recent times, and has endured despite increasing competition with humans for decreasing numbers of the squid and small fish vital for her sustenance and that of her ever-hungry yearly chick. Wisdom cannot know why the world has changed so greatly during her more than half-century of experience, nor would she know what to do even if she understood. Humans are the only ones who know the reasons underlying the worrisome changes, and we are the only ones with the means to do something about them. Technologies exist now to greatly expand the current modest global network of monitoring and observation stations to better predict and track weather, major storms, earthquakes, tsunamis and ocean chemistry. Coupled with satellites and other systems that acquire, transmit, analyze and store data, a growing fleet of manned, remotely operated and autonomous unmanned systems are providing vital knowledge about the ocean. Smart underwater floats and gliders are rapidly improving the quality and quantity of surveying and mapping. New batteries, new designs and the possibility of using clear glass to build deep submersibles to take people to full ocean depth for science, recreation and effective observations are on the horizon. For the same reasons that scientists camp out for weeks in the desert, systems such as the Aquarius Undersea laboratory based near Key Largo, Florida, may become a more common means for scientists to explore coral reefs and other habitats by submerging in their midst for days and weeks at a time. If we have the will we can, by 2050, cut CO2 emissions by half compared to 1990 and stabilise global warming below two degrees Celsius. We can choose to expand the current portion of the ocean dedicated to protection from just over 2% to 20% by 2020, or more if, as some propose, we treat the high seas as a Global Public Trust, free from humans extracting anything other than oxygen and water vapour. There is time, but not a lot, to make peace with the ocean by 2050, to treat Earth’s great blue realm as though our lives depend on it. Can the EU do more to protect deep sea life? Today proposed legislation on deep sea fishing from the EU Fisheries Committee will go to a vote by the plenary of the European Parliament. Last month a majority of MEPs on the EU Fisheries Committee voted against a phase-out of deep-sea bottom trawling and bottom gillnet (or “set net”) fishing, opting instead for a compromise that would require a review of the impacts in four years. By delaying in this fashion both of these damaging practices could continue for almost a decade. Our panel were asked to discuss how much more of the deep-sea habitat might be destroyed in this time. “We will have stripped away the ecosystem. The prospects for recovery will be much weaker” said Professor Calum Roberts, Marine Conservation Biologist at University of York and author of An Unnatural History of the Sea. And then there is the question of how much it is likely to cost EU taxpayers through national or EU subsidies and management costs. “There is enough economic rationalism to know what is happening” said Philip Burgess, former Co-chair of United Nations ICP on Oceans and the Law of the Sea. Aniol Esteban, Head of the Environment Programme at The New Economics Foundation added “as well as subsidies we must also think about negative economic returns. Deep sea trawling brings negative value. With such clear consensus on the negative impact of deep sea fishing on the environment and the economic health of the EU and the North Atlantic, why then is the scientific data that is being used to measure the impact failing to alter attitudes? “The sea is difficult to study…” said Dr Chris Yesson from ZSL, Institute of Zoology. “The data is only there for commercially viable species” said Laura Miller, Programme Director of Synchronicity Earth. Information on the deep sea is so scarce that even David Parker, marine biologist at Youngs Seafood Ltd, one of Europe’s leading fish product producers and distributors added “we don’t source deep sea fish as we don’t have the data. There is a business risk about not having systematic supply”. Barry Gardiner MP, Shadow Minister for Natural Environment and Fisheries was critical of the way decisions have been made. If not scientific data then what is informing policy making at a European level? “The quality of the debate is abysmal” said Professor Callum Roberts. “The impact of arguments made by the fishing industry is a factor” said Matt Gianni, co-founder and policy advisor at the Deep Sea Conservation Coalition. “The majority of the members of the committee are under considerable pressure from a relatively small, influential sector of the deep sea trawling industry,” he added. It was suggested by Claire Nouvian, Founder and Director of BLOOM and author of The Deep that this is a particular problem in France where she recently led a high-profile campaign to raise awareness culminating in a petition with over 100,000 signatures being sent to President Hollande. So, what could the British government do which might make a difference? There is currently no official government position on the issue although DEFRA circulated a paper to MEPs prior to European Parliament Fisheries Committee votes which raised a number of important concerns. Other documents circulated by DEFRA have however indicated clear opposition to a phase-out of deep-sea trawling and gillnet fishing. The UK government’s inaction was a source of concern for the panel, especially as this country had been active in shaping the UN General Assembly resolutions on this subject in the past. Several panellists were surprised that the activities of French deep sea trawlers in British waters has not become a greater domestic political issue. “Ten French deep-sea bottom trawlers could destroy an area of deep sea in UK waters the size of Paris in in less than two days” said Clare Nouvian. It was agreed that regardless of the outcome of the European Parliament vote on 10 December, the UK government has shown no leadership on deep sea fisheries, an issue that is both important to its environment and economy and on which in previous decades it had led the agenda. The importance of bathymetry may be obvious to mariners, ocean modellers and marine geologists, but among the general public only the boating community seems to understand the importance of knowing water depths and the shape of the sea bottom. Most uses of bathymetry are not compelling enough to attract the attention of the general public, yet there are many instances where knowing the shape of the bottom can save lives. Most dramatic are those times when the coast is struck by huge tsunamis, storm surges, or wind waves. The direction and size of these long waves are affected by bathymetry through wave refraction, which focuses their energy toward shallow ridges and away from deeper canyons. Many thousands of people have died because they lived at coastal locations toward which bathymetry focused the enormous energy of these long waves. The public needs to appreciate the importance of bathymetry in identifying coastal locations most susceptible to catastrophe when these marine hazards strike. On 26 December 2004, the tsunami generated by the submarine earthquake off Sumatra took 1 3/4 hours to travel the 1,100 km westward to Sri Lanka. The tsunami travelled at the speed of a jet plane through the very deep waters of the Indian Ocean, but then slowed when it moved through the shallower waters of the continental shelf. The first town in Sri Lanka hit by the tsunami was the fishing village of Oluvil. Oluvil was not the most easterly point in Sri Lanka; it was struck first because it was located at the end of a sub­marine canyon that cut through the ­continental shelf. Because a tsunami is a very long wave (i.e., its wavelength is much greater than the water depth), its speed depends on the depth of the water through which it is travelling. The tsunami therefore travelled faster in the deeper waters of the submarine canyon and reached the coast sooner than it did to the north and south of Oluvil. Twenty minutes after Oluvil was hit, the rest of the 400km-long Sri Lankan east coast was hit by the tsunami. This part of Sri Lanka was a poor and vulnerable area where fishermen and rice farmers lived in small wooden houses near the shore. When the large tsunami waves struck, flooding the coast, the devastation was extensive. Half of the total deaths in Sri Lanka were along the east coast – 15,000 people dead, 10,000 injured and 800,000 left homeless. This NOAA visualization tracks the 2004 tsunami waves until they reach the East African coast of Somalia. Being the first to be hit by the tsunami was not a bad thing for Oluvil. Only two people there were killed, while just 13km north of Oluvil, more than 8,500 died in Kalmunai, making it the most devastated town in all of Sri Lanka. At Oluvil the water level simply rose and then fell like a fast tide, but at Kalmunai a violent 13m high tsunami wave struck with tremendous power, destroying everything in its path. Later the Oluvil fishermen called their survival a blessing, which of course it was, but there was a more scientific reason why Oluvil escaped the tsunami’s wrath. In Kalmunai, the surviving members of families wiped out by the tsunami would have found it difficult to comprehend that their tragic loss (while others just down the coast were barely touched) was determined by the shape of the sea bottom below the dark ocean waters to the east. Propagation of the March 11, 2011 Honshu, Japan tsunami and maximum amplitude plot were computed with the NOAA forecast method using MOST model with the tsunami source inferred from DART® data. Oluvil was saved by being located at the shoreward end of a submarine canyon, while Kalmunai was demolished because it was near the shoreward end of a submarine ridge. 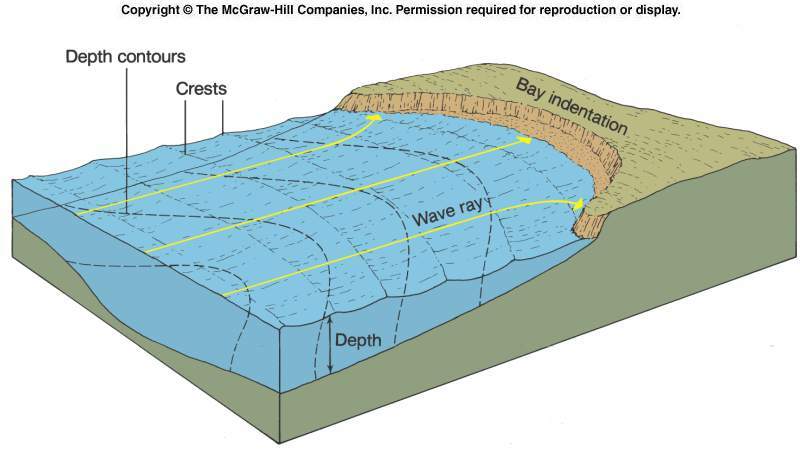 The submarine ridge acted like a waveguide, the energy of the tsunami being focused onto the ridge by wave refraction. Bathymetric effects on the 2004 Indian Ocean tsunami striking Sri Lanka. Because the speed of a very long wave like a tsunami depends on the water depth (its speed is proportional to the square root of the water depth), the parts of the tsunami in the deeper water on both sides of a ridge travel faster than the part of the tsunami in the shallower water above the ridge. The wave front therefore bends toward the ridge from both sides, focusing the energy onto the ridge and producing greater tsunami heights and thus greater flooding when the wave hits the shore. On the other hand, wave energy is focused away from the deeper waters of a submarine canyon, producing smaller tsunami heights when that wave hits the shore at the end of the canyon. Off the east coast of Sri Lanka there is an alternating pattern of submarine ridges and submarine canyons, which on 26 December produced an alternating pattern of death and destruction—great damage, then less damage, then great damage again, as one moved south along the Sri Lankan east coast. Near Kalmunai at least five locations experienced tsunami heights greater than 9m, alternating with locations with heights less than 5m. Some villages had little destruction and many survivors, while other villages were completely washed away. Tsunamis are not the only life-threatening coastal marine phenomena that can provide tragic examples of how bathymetry can determine who might die. Over the centuries huge wind waves generated by offshore storms have destroyed countless lighthouses, and here again bathymetry plays a critical role. Wind waves over the deep ocean have relatively short wave lengths and their speed depends on their frequency, not on the water depth. But when wind waves move into the shallow waters near coasts they become long waves and they are also refracted by bathymetric variations, being focused along the shallowest water depths. Lighthouses tended to be put on a headland or point or even on an offshore reef to give them as much visibility as possible to distant ships. From a safety point of view, however, there could be no worse place to put them. Because of the shallow water around them wave refraction focuses the wave energy directly onto them, often with disastrous consequences when large waves are being produced by a storm. Diagram illustrating the wave refraction of long wind waves. The logbooks of more than one lighthouse keeper have reported the assaults of truly enormous waves. But worse, sometimes the evidence for such a monstrous wave was the fact that after a storm had passed the lighthouse and its keeper were gone, wiped off the face of the earth by the sea. Perhaps the most famous of the many lighthouses that fell victim to extremely high waves was the Eddystone Light, which was destroyed three different times by huge waves. It was built 23km from the Plymouth Breakwater in the English Channel on a treacherous group of rocks, where the shallower bathymetry could amplify the already large waves produced by North Atlantic storms. First built in 1689, Eddystone Light was originally a 24m high octagonal wooden tower. Henry Winstanley rebuilt the lighthouse in 1699 to a height of 37m with a ring of stone 1.2m thick up the first 6m of the base. He was so confident of its strength that he said nothing would please him more than to be in his lighthouse during a great storm. Four years later he got his wish. He was in his lighthouse when it felt the full force of waves produced by the great storm of 26 November 1703, one of the largest storms ever recorded in the British Isles. The entire lighthouse, with Winstanley and five others inside, was washed away, never to be seen again. Storm surges, caused by the strong winds of hurricanes and gales, are also very long waves that force huge amounts of water onshore, flooding thousands of square miles of coastline. As long waves they are also affected by bathymetry. Generally the shallower the water the higher the storm surge heights and the greater the flooding. The shape of the sea bottom also affects which parts of the coast are flooded more, but given other factors, such as the variations in the speed of the rotating wind field around the eye of the hurricane, it is usually much more difficult to see this bathymetric effect in the flood water heights measured onshore. But when storm surge computer models are run, more accurate and higher resolution water depths produce more accurately predicted storm surge heights. When the tsunami stuck Banda Aceh, it killed many of the senior fishermen, lost with them was much of the traditional knowledge about the waters surrounding Aceh. Normally, this type of information is handed down father to son, this is their project to try to regain some of that knowledge. In this community-based bathymetric survey the traditional authorities coordinate the efforts of the fishermen to gather the data in order to map the sea floor. So far they have mapped 460 km of coastline out to the continental shelf; they have mapped three previously unmapped seamounts, four unmapped geologic faults and eighteen coral areas. In addition to the physical data they are also documenting key biodiversity areas e.g. shark nurseries, nesting beaches, spawning grounds to support the development of future fisheries management plans. Note: this project was accomplished for less than 10% of the cost of a normal survey and completed in less than one year. When the author wrote the book listed first in the references, bathymetry ended up being an important part of the story he wanted to tell. The main objective of the book had been to present a history of marine prediction that would get across to an educated general audience the impact of the sea on their lives and the importance of ocean physics. The approach was to interweave stories of marine disasters with stories of how scientists and mariners very slowly learned how to predict those moments when the sea would try to kill them. Most of the dangerous marine phenomena included in the book (tsunamis, storm surges, wind waves and the tides) are long waves, and as a result the importance of bathymetry became apparent in many of the book’s stories. The importance of bathymetry has been obvious for a long time to mariners, ocean modellers, marine geologists, ocean engineers and others who work on or by the sea, but among the general public only the boating community understands the importance of knowing water depths and the shape of the sea bottom. To a general audience its importance can sometimes be made clearer when they read stories that show how a knowledge of bathymetry can actually save lives. In addition to being critical to reliable forecast models, accurate bathymetry is an important part in planning for marine disasters caused by tsunamis and storm surges and large wind waves due to storms. The public needs to appreciate the importance of bathymetry in identifying those coastal locations most susceptible to catastrophe when these marine hazards strike. Those in the field of hydrographic surveying understand the importance of accurate bathymetric data, but we need to continue to look for ways to communicate that importance to the general public as well as to those in government who should support these activities.